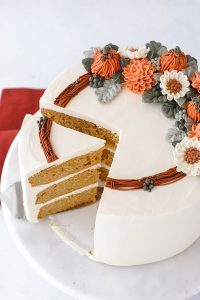 Pumpkin Spice Cake – moist pumpkin cake with subtle hints of cinnamon, ginger and nutmeg paired with pumpkin spice buttercream frosting. 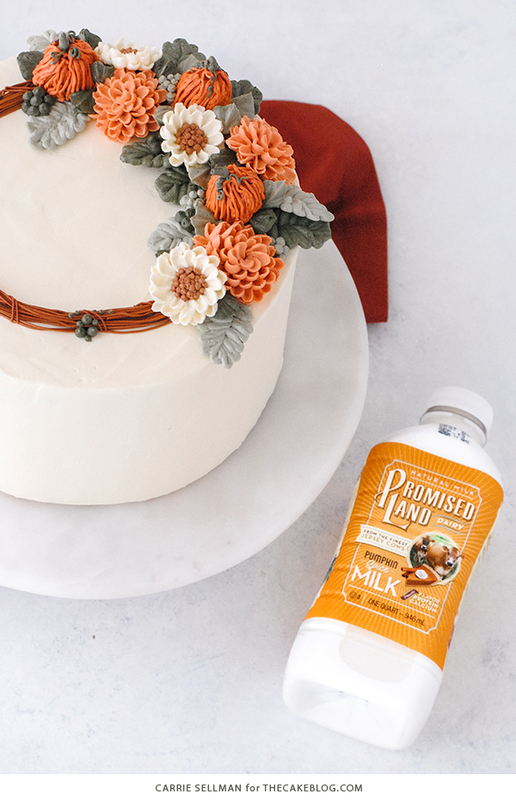 A fall cake recipe, sponsored by Promised Land Dairy for their #FarFromOrdinaryMilk campaign. Believe it or not, I’m writing today’s post old school style — like before laptops and tablets, old school style. Perched outside, I’m soaking up the evening twilight and savoring the crisp autumn breeze. Off in the distance, the sounds of happy children on a playground and the metal pings of bats and balls at a nearby baseball field echo through the air. With pen and paper in hand, I’m breaking out of my ordinary routine to enjoy every moment of this season, because well, it’s simply my favorite. What is it about autumn that’s so enchanting? Besides the drop in temperature and golden hillsides of color, I think the anticipation of fall baking ranks high on my list. It only seemed fitting to break out of my normal routine for today’s post — as this recipe is far from ordinary. 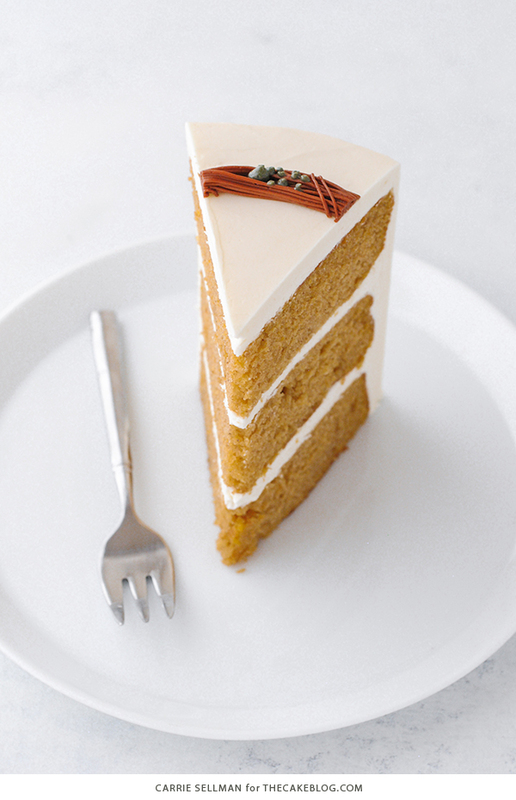 A classic fall pumpkin cake gets a premium upgrade with an exceptional seasonal milk. Promised Land Dairy Pumpkin Spice Milk is the richest, creamiest milk you can possibly imagine. Think delicious ice cream with buttery notes of pumpkin and a hint of spice, in liquid form. Because that’s seriously what it tastes like! While drinking it alone would easily satisfy all of your pumpkin cravings, my morning espresso has thoroughly enjoyed its new seasonal partner. Coming from a pampered herd of “Jersey Cows” who are known for producing a smaller quantity but higher quality milk with more calcium and protein (we’re big believers in quality over quantity), this pumpkin spice milk is a wholesome addition to pancakes, cookies, scones and even your morning cup of joe. And of course, I had to bake a cake with it!! 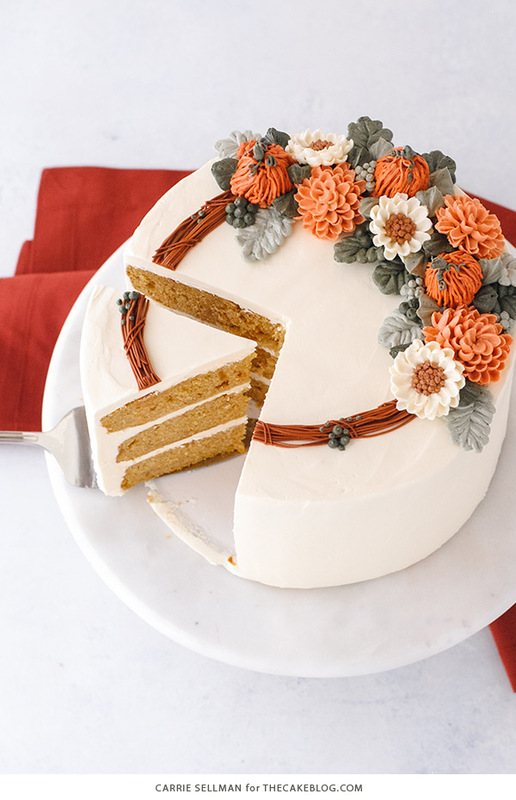 What makes this pumpkin spice cake so good? That’s where today’s recipe comes in. A tender and moist butter cake gets a hefty dose of pure pumpkin puree, cinnamon, ginger and nutmeg. Only to have the flavors amped up another notch with this premium pumpkin spice milk. It’s everything you love about fall, in cake form. Topped with the dreamiest swiss meringue buttercream that’s silky and smooth with a splash of pumpkin spice milk added for good measure. I challenge you not to eat all the frosting by itself, it’s that good. The struggle is real people. The struggle is real. 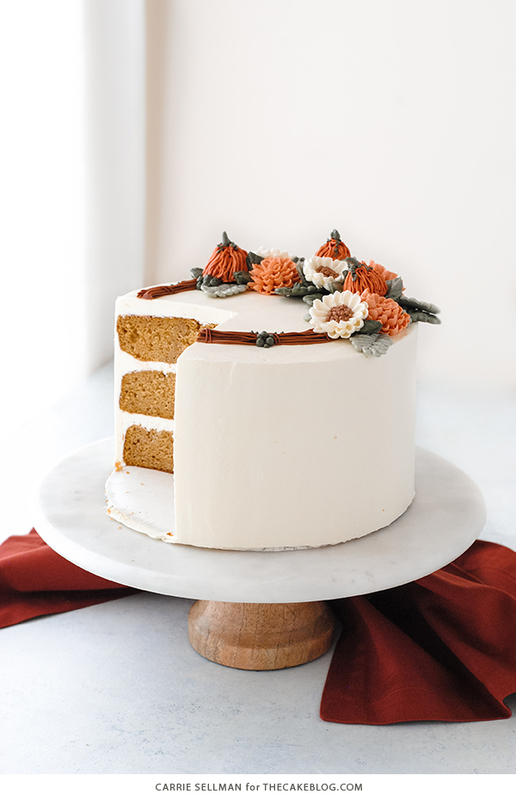 Moist pumpkin cake with subtle hints of cinnamon, ginger and nutmeg paired with pumpkin spice buttercream frosting. I made two batches of frosting for the cake, as pictured. One batch is plenty to fill and frost the cake itself. The second batch was made, minus the pumpkin spice milk, to pipe the buttercream flowers. 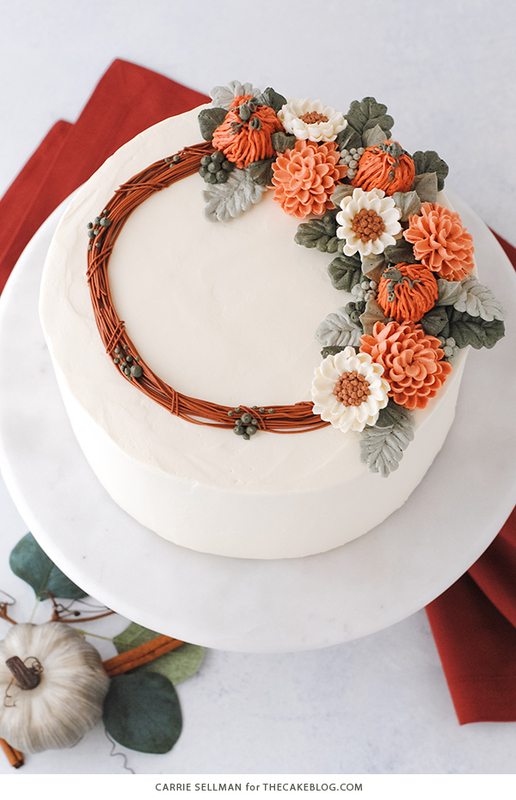 I used pastry tip #81 to pipe the buttercream chrysanthemums and daisies, tip #233 for the vines and pumpkins, tip #104 for the large greenery and tip #366 for the fill in leaves. Find a tutorial for the leaves and wreath HERE. Love, love, love the piping. Would you please do a tutorial?!?!? Promised Land milk appears to be a localized product. Can you give us Amy adjustments to the recipe for those of us that cannot find it? You can check if it’s available in your area HERE, or request it HERE. Otherwise, the best substitute would be whole milk. I can’t say for sure because I haven’t tested this recipe with a creamer. The fat content of a creamer would be different than the milk. The buttercream is a Swiss meringue buttercream which really smooths nicely. Hope you enjoy! I was unable to find the flavored milk and ended up using an almond milk pumpkin spice creamer. It turned out great and I did a straight substitution as far as quantity. Beautiful cake and I have no doubt that it is delicious! What a lovely piping design. If you could please post a tutorial for the rest of us home cooks it would be so very appreciated. Always eager to learn! Thank you Jan! I will try to work on a tutorial for the piping! And I agree, what can we use to replace the pumpkin spice milk? w don’t have it here in Canada. Thank you Jenny! The piping tips are all Wilton. For the pumpkin spice milk, you can check if it’s available in your area HERE, or request it HERE. Otherwise, the best substitute would be whole milk. Thank you for the recipe. 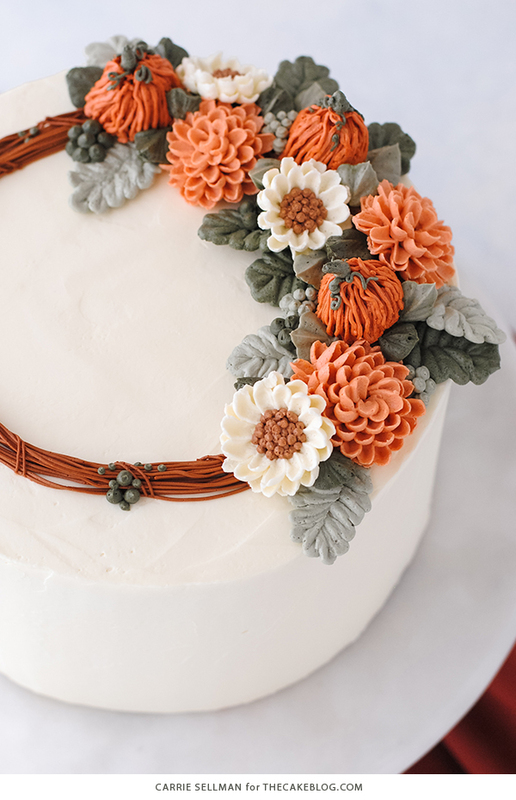 Could you steer us to a piping tutorial and how to get these fall colors? Thank you so much. Yes, please do a tutorial for the flowers, vine and pumpkins! Beautiful cake! Love these flowers! Can you please post a tutorial on how to pipe these? I so badly want to make and eat this. Like others have said, I cannot get this milk locally, which is too bad because it sounds delicious. What can I use to substitute this milk and still make this gorgeous cake? I suppose I could google this, but does another company make pumpkin milk? I wonder if pumpkin coffee creamer would work. What about using pumpkin spice coffee creamer? I can’t say for sure because I haven’t tested this recipe with a creamer. The fat content of a creamer would be different than the milk. Hiland has a pumpkin spice milk out right now, just found it last night at a Cash Saver! What are the names of the colors you used on your decorations? This is just so beautiful! The contrast of the cake against the frosting is killing me; and your piping is really the icing on the cake. I want to bake this NOW! We sadly can’t get anything pumpkin spice related here, not even the spice itself, and I’m so desperate to use it in my baking! I can smell it through the screen, I’m sure! I have to do this recipe ! Beautiful cake! Would love a tutorial! Wow, thank you Joan! Happy Autumn to you as well! Your cake is so beautiful and sounds absolutely delicious! I LOVE just about anything pumpkin and pumpkin spice flavored! Being lactose-intolerant, I have to use substitutes for milk so I am always checking those out, especially this time of year. In the past I have seen a pumpkin spice flavored milk substitute (I think it was soy) that those who can’t find the Promised Land milk might be able to use. 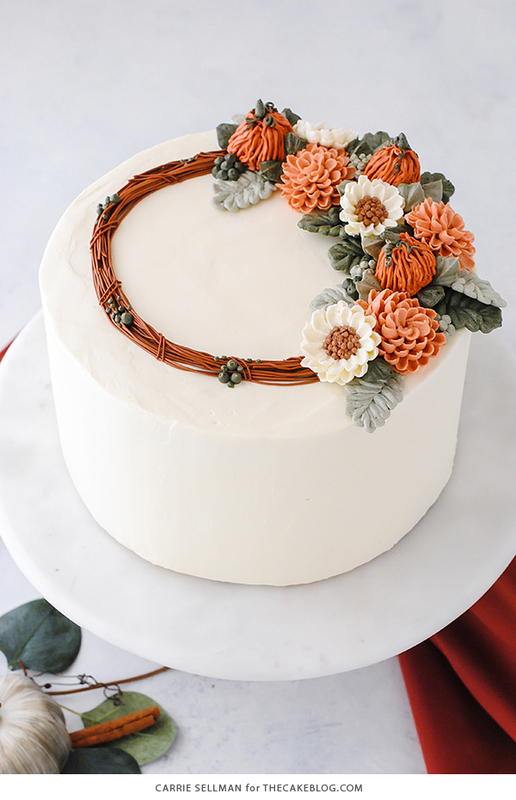 I hope you will do the tutorial on piping the flowers. They look amazing! Carry, this is totally up my alley. I’m not so familiar with beautifully decorated cakes but with this recipe, I think I will master it. Beautifully done!! Would absolutely LOVE a tutorial! How would we know when you do one? Do you email the one’s who requested one and let them know? The best way to know once a tutorial is published would be our newsletter. It goes out every time we publish new content. There is a link at the very top of this page where you can “Sign Up For Our Newsletter”. the cake looks really amazing, and I am so sure that it will be as delicious as it looks. This is one of the most beautiful cakes I have ever seen! The colors are gorgeous, the flowers are stunning. Just magnificent! !